The latest results from the 2018 Edelman Trust Barometer now reads like an obituary column in the West for the very institutions that are supposed to support civil society. This is the 18th edition and annually involves 33,000 respondents from 28 markets around the world and it makes for uncomfortable reading. In this report, there’s a hidden warning for all the people of Britain about what its future is likely to be. Its Executive Summary report starts with the headline – ‘The Battle For Truth’. Its very first sentence reads “As we begin 2018, we find the world in a new phase in the loss of trust.” Need I say much more! Well yes – because the diagnosis gets worse than ever before. One conclusion many of us arrived some time ago is that the mainstream media has become the least-trusted institution of all and for the first time it has fallen even lower than that of trust in government. The results here are not just dire – it’s truly disturbing when you read: “With trust scores of over 50 percent in only six markets, five of which are in the developing world,” you know the world is going to pot, well it is for those in the West. The report highlights that half of the population read mainstream media less than once a week. Nearly six in 10 agree that news organizations are completely politicized, and 50 percent believe they are elitist. Nearly two-thirds agree that the average person cannot distinguish good journalism from falsehoods. There has even been a crash in trust between peers. From here, this is where is gets really serious. You might be surprised to learn that China is showing the most extreme positive changes in trust and the U.S. the most extreme negative changes this year? The U.S. is enduring the worst collapse ever recorded in trust. In fact so bad has trust become in the U.S. – it has crashed to the very bottom of the entire survey, whilst China’s population see its nation slowly rising until 2018 when it ascends to the very top. Mind you, overall results do not bode well globally. Twenty of the 28 markets surveyed now fall into the category of distrust, almost all linked to bribery, corruption and scandals of one sort or another. Respondents have almost entirely given up on good government. 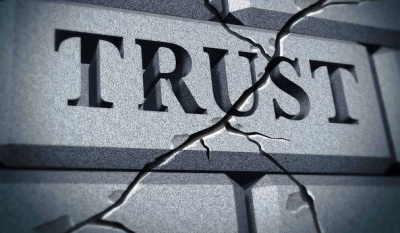 Seventy percent say that building trust is the No. 1 job for CEOs. Nearly two-thirds say they want CEOs to take the lead on policy change instead of waiting for government and in today’s world that says something because just a few years ago trust had collapsed in them as well. The bar is now set so low that people are looking for any type of good leadership. This is perhaps the explanation for the rise of strong-men and political extremists. Digging deeper into the report makes for depressing reading as there is no real good news. Nothing tangible is recovering from its new annual depths. The most trusted governments in the world are China, Indonesia, India and the UAE. The USA, UK, France and Germany sits in an ever growing category of least trusted. The world appears to be upside down. “The public’s confidence in the traditional structures of American leadership is now fully undermined and has been replaced with a strong sense of fear, uncertainty and disillusionment.” Just replace the country name with Britain – the same applies. Both are in freefall. Six country markets have seen extreme collapses in trust but nothing as bad as in America. Fake news seems to be at the very heart of these collapses. Seven in 10 worries that fake news is being used a weapon against them. In contrast, technical experts make a recovery and are now the most trusted. Again, this must be a low bar because trust in ‘experts’ collapsed just a few years ago and is now ‘rebounding’. The UK only has to lose four places in trust of all four institutions that uphold civil society and it joins a small band of just six desperados in the ‘extreme loss of trust’ category. A full 70 percent believe they are targets of fake news and disinformation campaigns, with the UK ranking almost bottom in all markets for trust in the media. Trust in search engines and social media in Britain fared even worse – if that was possible. I’m sure the Cambridge Analytica/Facebook/Brexit debacle has something to do with this and as Britain now has the most right-wing and unbalanced media in Europe, this surely has just as much to do with it as well. The one bit of good news was that trust in employers had increased globally, Britain included. But here’s the yang to the yin; 60 percent thought CEOs were driven more by greed than a desire to make a positive difference. The most negative attitudes towards business leadership were in Britain and America, with technology the most trusted and financial services the least trusted. China hits the top five in trust of NGOs, business leadership, government and media – the last two of which, was the No1 slot globally. Britain falls to the least trusted in three of the four categories, the US in all four. Trust in brands that were headquartered in their home country revealed that the USA was the biggest faller of all countries in all markets. The news simply could not get much worse for the USA. It should be of no surprise that news rejecters in the UK cite that the news agenda is too depressing (40 percent), that the news is too biased, and that the news itself is controlled by “hidden agendas”. Distrust in Britain is endemic across the board and Britons are becoming more pessimistic about their economic outlook. The trust barometer also shows where the biggest concerns are for the future of Britain. These include ensuring the NHS is able to provide care for an ageing and growing population (79 percent) and the worry of rising political or religious extremism (72 percent), whilst only 20 percent feel their standard of living will improve in 2018 and 36 percent expect it to worsen. The end result is that Britain is lying fifth from the bottom of the 28 markets surveyed. This is driven by poor governance, supported by a deceitful media and NGOs (ThinkTanks) who seem able to drive divisive policies such as privatisation with such ease today. What an uninspiring performance from the sixth largest economy in the world. But then again, looking around, is that really any news if you happen to be British? When you consider that in almost every metric including, health, education, poverty, standard of living, inequality and the like, life for half of Briton’s is a crisis of daily life. Who would you trust in an environment like that? But there is something even more concerning. Britain still likes to think it stands shoulder to shoulder with America on the world stage and look where that has got us. Trade negotiations will degrade British standards in critical areas that support civil society, much as those reported in this article. Britain is following an utterly failed project. The “New American Century” as a policy document for extreme neoliberal capitalism has now shown what is behind its gossamer mask. All four of the main institutions in America are in collapse mode. In Britain, we seem to applaud this American economic model, which, even when it’s working well, benefits very few ordinary people. Jeff Bezos, CEO at Amazon demonstrates how the world’s richest man ruthlessly exploits his employees at all costs. Zuckerberg and his shadowy surveillance organisation Facebook are in the dock for ruthlessly and illegally exploiting its ordinary customers to the benefit of its richest, whilst threatening the democratic principles of the West. Who would trust these guys, often paraded by the media as the cornerstone of modern-day economic super-heroes? As a Briton, currently living abroad it is much easier to see Britain’s blind subservience to America, which has all but destroyed its international reputation. My country is now suffering the effects of this acquiescence. We should stop following their stupid global ambitions (that usually involves killing brown people in their millions) and costing us billions we don’t have. Brexit came about largely as a result of immigration. That came about largely as a result of uncorking the African migration trail by attacking Libya – another reckless foreign policy choice this ludicrous and self-serving crop of politicians got so wrong. And now, we could just as easily be dragged into a long, protracted, arduous and dangerous fight on the front lines of the war between East and West in Syria – because of what? Britain should for once stand on its own two feet and fully focus on what its good at without the delusions of grandeur that the top table in No10 Downing Street seems to have. We should aim to be the great, mid-sized liberal country that punches way above it economic size to the benefit of us all. We should rebuild trust with global partners, contrary to what America has achieved in this ‘Trust Barometer’. America has no friends, it has little more than the frightened and sycophantic following it around. We are one of them. Will a leader please stand up for we need one right now.